It should come as no surprise that a CONCACAF tournament at some point will have a few terrible calls that may or may not sway a match or two one way or another. After all, this region is exemplary to what bad refereeing is like on a national level. 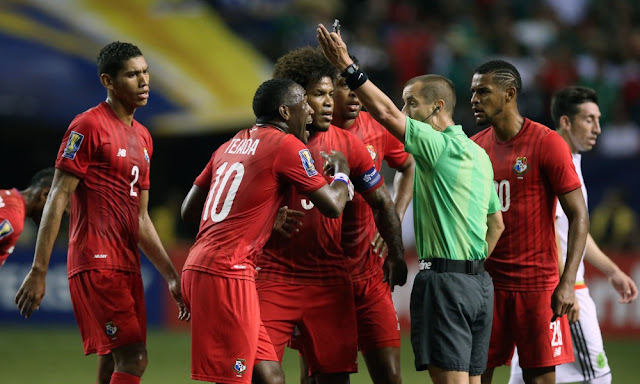 Time and time again North and Central American and Caribbean refs have shown a lack of not only refereeing skill, but commonsense altogether and this time around Panama's national team was the one that felt it most. I have watched American referee Mark Geiger many times call matches in the past; he is considered to be (at least by CONCACAF standards) a pretty decent rer. But even then, I've seen him make a variety of questionable calls both on the international and domestic levels. Calling the Panama versus Mexico showcased mister Geiger's incompetence yet again. A questionable red card in the 24th minute and a penalty shot for the Mexicans to level the match up at 1-1 in the 88th minute had "controversy" written all over the match and the Panamanian players and staff couldn't hide their frustration, unlike many others who have been victims to brutal officiating in the CONCACAF region in the past. 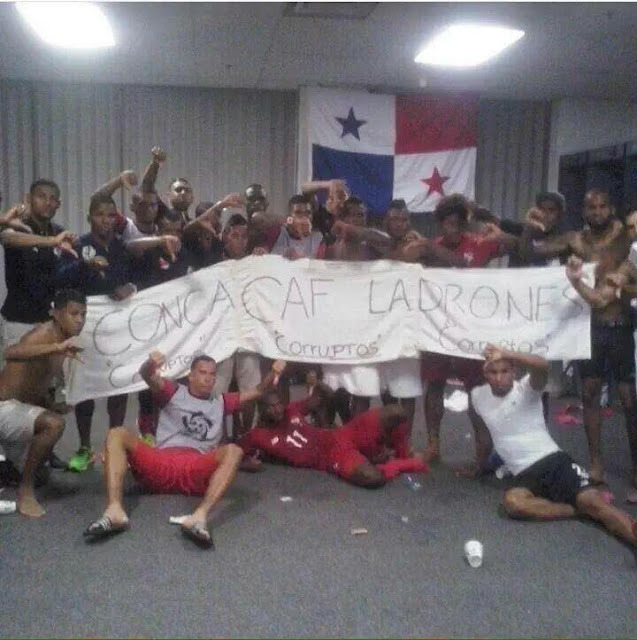 The Panamanian footballers were photographed holding a sign that read "CONCACAF Ladrones, Corruptos, Corruptos, Corruptos", which translates to English as "CONCACAF Thieves, corrupt, corrupt, corrupt". But to make matters even more interesting, Mexican Andres Guardado who scored the penalty shot to tie the game at 1-1 said this post-match: "It was painful. Yes, for a minute, yes [I considered kicking it wide] but in the end, we are professionals and you think about the times you have been on the other side and the hearts of the other team's players aren't moved".